Analysis: Are Texas lawmakers done with drama or just saving it up for later? The Texas House sent a $250 billion budget over to the Senate with a unanimous vote after a debate that had remarkably few tense moments. With school finance, property taxes and revisions to that budget still ahead, will the comity hold? The 86th Legislature runs from Jan. 8 to May 27. From the state budget to health care to education policy — and the politics behind it all — we focus on what Texans need to know about the biennial legislative session. Give the new speaker of the Texas House his due: He managed to avert the legislative firefights that often break out during debates on state budgets. 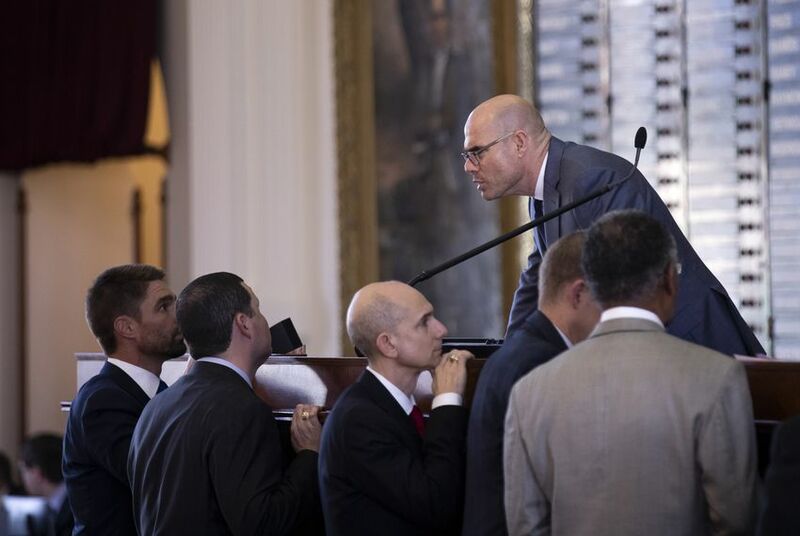 Dennis Bonnen, Appropriations Committee Chairman John Zerwas and their helpers ran the show — stretched out over most of Wednesday and into the early hours of Thursday — like hyperactive fire marshals, putting out fires before the fires ever got started. A vote on an across-the-board teacher pay raise was withdrawn after a threat of a point of order that would have prevented debate. A vote on expanding Medicaid — a big issue for some Democrats and, more privately, for a couple of dozen Republicans — failed 80-66, without raised voices or angry words. An amendment that referenced “illegal aliens,” sure to spark partisan tinder, was pulled down when the author got a promise of a smoother path for other legislation dear to him — requiring local governments to say what they spend on lobbyists. A freshman lawmaker swapped a controversial budget amendment for prompter hearings on her pipeline bills. An amendment that would dedicate $2.7 billion to property tax relief brought some of the most conservative Republicans on board. It was boring. Peaceful, even. Just what a legislative leader wants when the most important bill of the session is on the floor. When the 11-hour drone was over, the House voted unanimously to send the bill on to the Senate, where a much different budget bill awaits. There’s debate ahead, but the House will go into it apparently unified. Other pieces await. Next Wednesday, the school finance bill — part of the public education and property tax centerpiece dictated by the state’s top leaders — will be on the House floor. It’ll be followed a week later, if the plans hold, by legislation requiring voter approval of property tax revenue increases over a set amount. The budget passed in the wee hours — just after midnight — and was followed by a meeting of the House Ways and Means Committee, which approved legislation that would require cities and counties to get voter permission for property tax increases over 2.5 percent. It’s not as strict as what was originally proposed, but it’s still not to the liking of the local governments it would affect. But it’s moving, as are the budget and the school finance legislation, and the members of that committee, while not unanimous, were models of good manners in their disagreement. The change in tenor at the Capitol is matched by a change in what lawmakers are afraid of — or at least appear to be afraid of. For several sessions, outside conservative activists have had outsize say in legislative politics. The Texas Public Policy Foundation urged state representatives to vote against the budget. None did. Empower Texans, a political organization whose hectoring used to move rightward the votes of anxious Republicans in the House and Senate, was left with a laundry list of complaints the morning after: about the “fiscally irresponsible budget” and property tax legislation that doesn’t cut taxes as much as they’d like — if at all. In the email to supporters detailing their dismay, they also asked for donations, suggesting contribution amounts higher than the average property tax cuts offered by the legislation they don’t like. There are rough patches ahead. The Senate Finance Committee came in the next morning to approve its version of the budget, which makes different assumptions, has different priorities and will have to be reconciled over the next eight weeks with the House plan. All of that’s normal. The Senate doesn’t have a school finance plan ready to go but has approved — unanimously — a $5,000 across-the-board pay raise for public school teachers and librarians. Some foreshadowing: There isn’t enough money in the budget to pay for that and to also do with school finance what the House is proposing to do. And neither chamber has lined up behind any of several ideas for buying down Texan’s property taxes. Proposals range from big cuts — paid for with higher sales taxes or by shedding current tax exemptions — to smaller, narrower cuts paid for by diverting oil and gas tax revenue that would otherwise go into the state’s savings account. So far, lawmakers aren’t publicly battling. It’s all smooth on the surface. Nothing to see here. But the usual differences and political stresses are all in place — right below the surface. Disclosure: The Texas Public Policy Foundation has been a financial supporter of The Texas Tribune, a nonprofit, nonpartisan news organization that is funded in part by donations from members, foundations and corporate sponsors. Financial supporters play no role in the Tribune's journalism. Find a complete list of them here. Analysis: Texas lawmakers will obviously need a special session, right? Only if they screw things up.